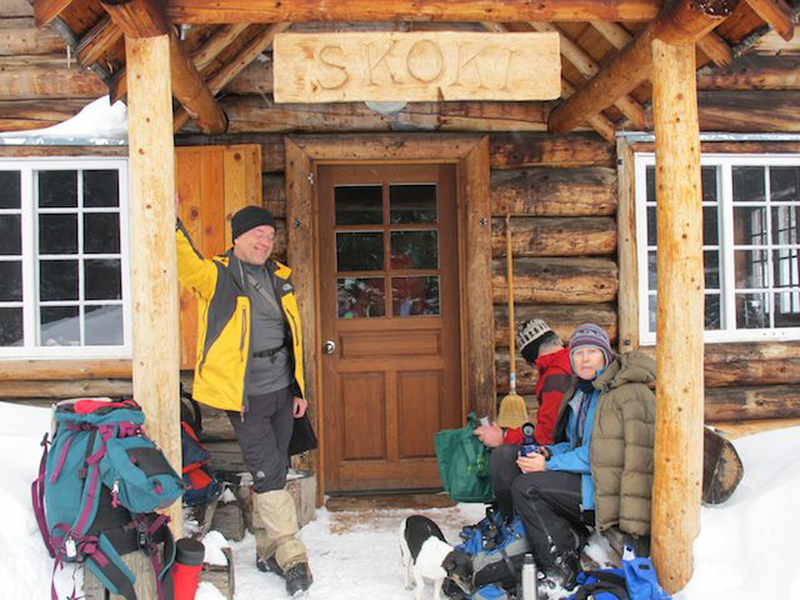 Walter, Steve and Jane stop in at the historic Skoki Lodge. Once we got vehicles unstuck and somewhat parked Karen and Steve ran a great day tour up to Skoki Lodge and back with mostly sunny weather and a few windy sections. A couple of us headed back early and got an early start on the Pub Grub themed dinner and practiced our drawing skills for a confusing game of Pictionary. 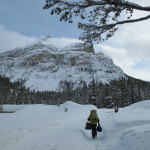 This entry was posted in Banff National Park, Mountain Tours, Trip Reports and tagged Backcountry Skiing, Castle Mountain, Cross-country Skiing, Deception Pass, Mount Temple, Rockbound Lake, Skoki Lodge, XC Skiing on 2011/03/01 by parkland. It seems to be the year of back-up plans. Here we are at Mosquito Creek on Friday night, 6 of us chomping at the bit and all looking forward to a great weekend at Bow Hut. 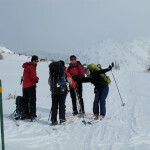 But after evaluating the avalanche bulletins for an hour or so, we came to the conclusion it was not worth the risk. For the 2nd time this season the best back-up plan seemed to be Skoki. It was a fabulous day and after a relaxed sleep (no snoring on ladies trips!) and getting up at 7:00 (or was it 8:00? – it was time change weekend) we were off. Sunday’s ski took us to the Paint Pots in time for lunch in the sunshine and some goofy photos and girly talk! 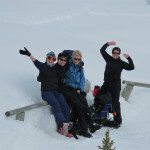 This entry was posted in Banff National Park, Mountain Tours, Trip Reports and tagged Cross-country Skiing, Skoki Lodge, XC Skiing on 2011/03/01 by parkland.